Girl Writing. Edmund Tarbell, 1917. Oil on canvas. Collection of Philadelphia Museum of Art. My last night of vacation. The soundtrack is a long list of “shoulds” tumbling over and over through my brain. I should make the zucchini and black beans taco recipe so I have lunch for the week. I should do the laundry I didn’t get to at all these past two weeks. I should clean the bathroom and spray the ac/heater units with baking powder to keep the mold away. I should…. I should…. I should…. I keep reminding myself that there’s nothing on the list that can’t wait till tomorrow. Or next weekend. That it’s okay to simply sit here with “my palms up and utterly empty” to (poorly) paraphrase Miss Plath. That it’s okay to simply sit here and think about how fun it was to be in Philadelphia with S. who has known me since I was 20 and who cemented her friendship with me as we wandered around Chicago together post-college wondering at the strange new city in which we found ourselves. 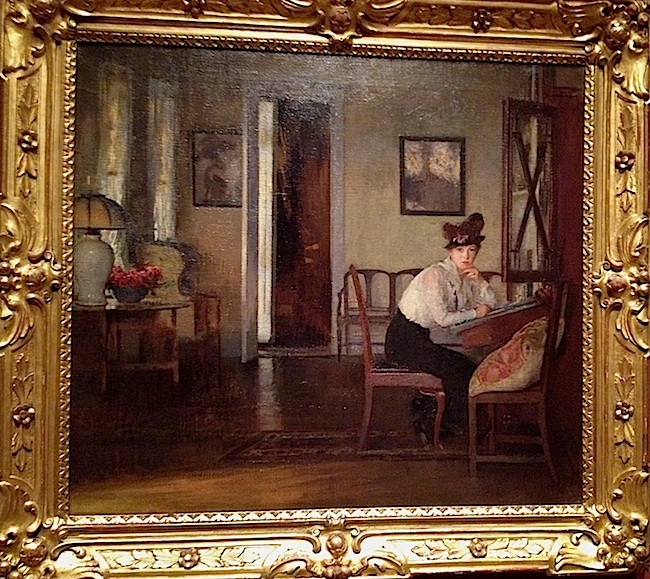 I’m thinking too of the guard at the Philadelphia Museum of Art who unexpectedly told me that I was looking at her favorite painting: Girl Writing by Edmund Tarbell. When I asked her why, she said, “Because [the woman” is so quiet and focused. She reminds me of me.” I told her the painting’s composition reminded me of contemporary fashion shoots and then we bid each other a good day…and meant it. I’m also thinking about Chocolat (which I read this week)—the novel—which was markedly different than the movie, the film being a mere inchoate version of the novel’s story. It’s the first time in a long time I’ve read a book after seeing the movie (and this one several times). I found the movie characters distracting especially as they were so unlike the ones in the book. Not that I don’t like Juliette Binoche and Judi Dench dancing through my head, but Johnny Depp and Alfred Molina didn’t belong, at least not this time. I’m also hoping I really will finally get to the Italian Meet-up this week—an outing to see Woody Allen’s new movie set in Rome. I need to meet more people, not just for the sake of meeting more people, but to open a few more doors in the direction of dating. Which seems a slightly ridiculous thing to be worrying about at 42 but nonetheless…. There’s no moral to this story tonight. Simply that I will dispense with the shoulds tonight as they will be back in full force at 8 or 9 am tomorrow. Tonight I’ll watch a Netflix movie perhaps, occasionally gazing up at my pink wall to remind myself of all that I’ve accomplished in the last two weeks, and then I’ll sleep perchance to dream…. of my next vacation. Posted on July 8, 2012, in Uncategorized. Bookmark the permalink. Leave a comment.